I have had a crazy love affair with Coffee since I was thirteen years old! I had my very first Cafe Mocha at a little shop in Santa Cruz California at that time. It was love at first sip! Since then, I have been a lover of both the little mom and pop coffeehouses as well as the giant coffee chains. In the past I have worked as a Barista and I have always had an espresso machine in my house. It is an essential luxury in my life I tell you! "This Satan's drink is so delicious, It would be a pity to let the infidels have exclusive use of it. We should cheat the devil by baptizing it." Capuchin Monks are responsible for the name of the classic espresso beverage, the Cappuccino! I've read two accounts of the reasoning behind this; one being that the color of the creamy coffee concoction resembled the color of the Italian Franciscan Friars robes, the other that it was used to help them stay awake through early morning prayers. The angel Gabriel is also connected to coffee. In the Muslim faith, it is said to have been gifted to the prophet Mohammad by the angel Gabriel to imbue him with strength and stamina. Similarly, angel Gabriel is said to have instructed King Solomon to brew up coffee to give to the sick people of a town he was entering. According to this story all the ailing people became well again after consuming the beverage. However drinking it is not the only way to indulge in the wonders of Coffee. As an essential Oil, it can be used for a number of things such as anxiety, depression, inflammation, low metabolism and so much more! By adding 3 drops of Coffee Essential Oil to a dropper full of a carrier oil of your choice you can create a very effective topical treatment for inflammation, sore joints and tension. You can adjust the ratios to your choosing but starting off with 3 drops is a great! For anxiety and depression, you can add it to a diffuser. Magickally speaking, Coffee can be used in spells. It can be used in manifestation work to bring results faster. It can be used to empower other spell components in other types of magickal work too. Coffee can get rid of nasty, stagnant energy in a space. You can easily add this intention to your coffee as you brew it each day. Intend that the aroma adds a positive and harmonious energetic flow to your household as it removes any stale energy. 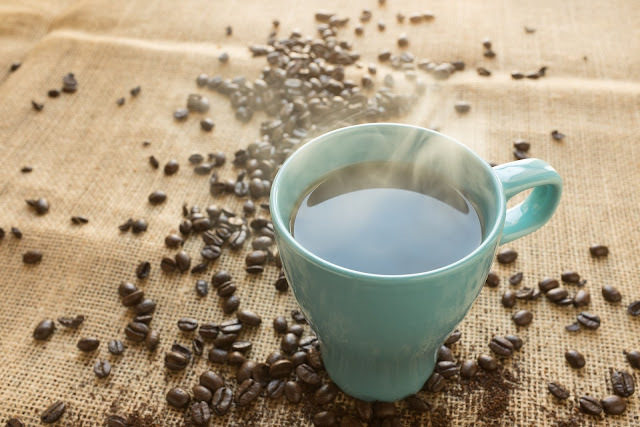 (Don't forget to add used coffee grounds to your garden!) I like to add a few drops of this to a diffuser as I smudge my house with Sage. You can bless your coffee before you drink it, taking in the empowering properties to help you get more accomplished during your day as well as to stay focused and grounded. Coffee is also said to aid in ridding oneself of a curse, as well as being able to increase personal charisma to draw positive attention to yourself. These are just a few stories and ideas about one of my most beloved things in this wonderful life of mine. Coffee adds a touch of magick, luxury and mysticism to my days. How do you use coffee? I would love to hear your experiences with this marvelous elixir!